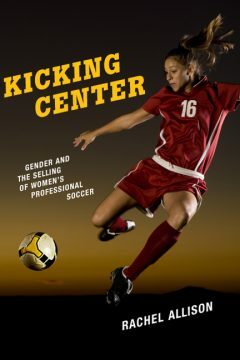 The second FSF session of 2019 featured sociologist Rachel Allison, author of an engaging new book titled, Kicking Center: Gender and the Selling of Women’s Professional Soccer. The conversation delved into the team at the heart of the book and then examined various aspects of the marketing of WPS—the second women’s pro soccer league in the United States—as well as its social context and audiences. The book’s themes of race, class, gender, sexuality, and social media were explored in detail. The discussion also brought out continuities and changes between the defunct WPS and its successor, the NWSL, now in its seventh season. For her next project, Allison will be traveling to the 2019 Women’s World Cup to conduct a study of women’s soccer fandom. This exciting new work is funded by a prestigious FIFA-CIES research scholarship. Participants included: Andrew Guest, Adam Winkel, David Kilpatrick, Steven Apostolov, Danyel Reiche, Titi Kou, Todd Cleveland, Chris Henderson, and Peter Alegi. Listen to an audio recording of the session below.